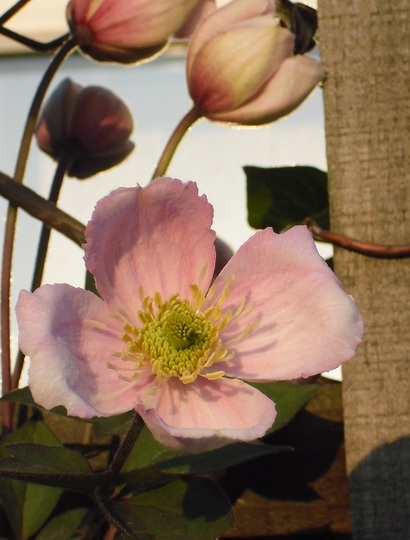 You can visit our Clematis montana page or browse the pictures using the next and previous links. If you've been inspired take a look at the Clematis plants in our garden centre. Neighbour John planted this last year & it's scrambled along three of the trellis-topped fence panels already. We are both able to enjoy it! It's deciduous, Jacquie, but is vigorous, Ht. 5m in 5 years. Takes full sun to heavy shade. Can you tell I read the label ... lol! Oh, John didn't prune it at all, I just snipped off the dead twining bits in February, easy-peasy! John tells me it was a bargain ... though he's a bit miffed as all the flowers seem to turn to face my side ... lol! See who else is growing Clematis montana 'Giant Star'.